The rock tumbler comes in many different types and brands, they are available in a variety of sizes (and to some extent shapes) and they are manufactured to meet the needs and expectations of the users whom they are aimed at on an individual basis. For example, if you need your rock tumbler for professional lapidary (perhaps for jewelry making and selling), then you will probably not be satisfied with either the capacity or final polish depth of finish and shine provided by the lower end of the market or the kind of tumbler which has been made for children as an introduction to the hobby. Naturally, this is a more extreme example and in essence compares the two ends of the scale of rock tumblers available – however there are variables all along the range which can be considered based on application and requirements that can influence the decision regarding which rock tumbler might be best suited to your requirements. Vibratory Rock Tumbler Types Below. Which Rock Tumbler is Best for Your Requirements? Longevity and rock tumbler product quality, in terms of both the barrels and the motor, will be important for those who wish to undertake a long term (many batches) hobby and build a personal collection of their favorite tumbled specimens. A collection built over time, with rocks tumbling on an almost permanent basis will require a robust machine with a sound warranty and more than likely will be made by a well known company in the lapidary industry. For anyone considering starting up a small business selling their work, further considerations should include availability of spare parts – such as drive belts, motors, barrels and seals. This is because the grit will wear out the barrels over time, it’s simply a case of the more rocks you tumble, the more wear and tear stress will be inflicted on the equipment, eventually making it unusable. As always, there is a fine balance between cost and functionality and the rock tumbling machine is no exception. Capacity is another issue worth careful consideration. You must remember that as the grit wears away the rocks, they shrink, so whilst the tumbler’s barrel will appear full at the start of a new batch of rocks, it will reduce over time and the final output will be far less than the original input. The amount by which the volume is reduced depends very much on the type of material and the final result you aim to achieve. Therefore, when viewing different machines, have a think about the quantity of polished stones you wish to be left with at the end of the run. Getting this wrong can mean having to run multiple sessions of the same rocks – greatly increasing the length of time it takes to create the final result which can mean delays of months in production. The design of a kids rotary rock tumbler and starter kit is very often different than the design of a professional / hobbyist tumbler. Very often the parts tend to be made of plastic, and for safety reasons the motors are well hidden with all the pointed parts rounded off smoothly. The moving parts such as the rotating barrel are also sometimes covered with a protective screen. There is also sometimes a timer facility built into these which allows the owner to set the machine going for a length of time, automatically stopping the rotation of the barrels after this period (measured in days normally). 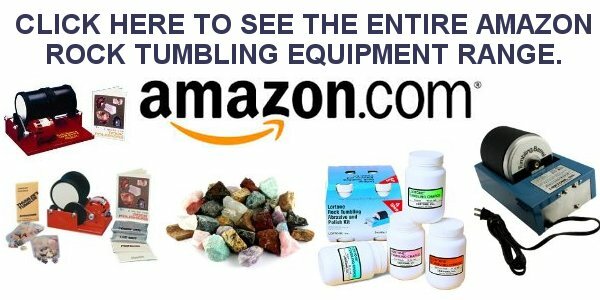 It should realistically be noted that children must be supervised by an adult at all times when participating in tumbling rocks, because after all, we are using electrical products, chemicals, sharp stone, sometimes a rock hammer and more often than not, implements found in the typical household kitchen! You may want to have a read of the basic instructions for using a rock tumbler which we have provided here, and within these you will encounter some of the limitations of choosing a very basic kit for kids. Having said this, you should be able to get a few good batches of rocks before running into problems and the related costs can be kept to a relative minimum – if the hobby grows, more expensive equipment can be bought if needed. There is definitely an art to getting a fantastic shine on the rocks you decide to put through a rock tumbler, and whichever device you choose or own already, the best results will always come with a combination of time and patience. This doesn’t apply to “waiting for it to finish” – that is a must, what we mean by time and patience is really more specific to how your skill will develop as you tumble more and more batches of rough rock to a standard you are satisfied with, and indeed, your standards will probably raise the more rocks you tumble. So whilst it isn’t really possible to attain the art by reading guides alone, learning the basics from the very beginning will certainly get you on the road to success if the directions below are followed very carefully. Many people are turning their hand to lapidary and remember owning a rock tumbler when they were younger – if you fall into this category, we are certain that the sound of the barrel turning will bring back some long lost memories. Happy Tumbling! Perhaps often overlooked are important factors when using a rock tumbler. Read this preparation page to ensure you are ready to leave an electronic device, powered up, alone and running for long periods of time in a safe environment. The idea behind the first step is to take your rough rock and grind it (tumble it) down into a form which is indistinguishable (in shape) from the final product. The size and shape of the rocks at the end of this first step will be more or less the same as they will be once they are completely shiny at the end of the fourth step. Step 2 of using a rock tumbler is in itself a two part process. These tumbles will not actually shape the rock, instead it will work on the outer surface making the rocks smoother and smoother until they are ready for the final polishing which is the ultimate goal. And now for step 3. This will add a shine to the gemstones you have worked so hard in the tumbler now for many weeks – it is the last stage. Doing this part right will make it all worthwhile, so apply concentration to how clean and free from grit the barrel and rocks are and the results will be amazing.